October is a prime time for planting wildflower seeds in the garden. The mild temperatures of fall allow the seeds to germinate, develop a good root system, and then go dormant until spring. Select an area that drains well, but doesn’t have overly rich soil. Rake the soil only to a depth of about an inch. Mix one part wildflower seeds with four parts sand. Broadcast the seeds over the new bed, first one way, then the other (i.e., north-south, then east-west). Walk over the bed to press the seed into the soil, but do not cover the seeds more than 1/16″. Water lightly and frequently if you don’t get adequate rain through the autumn. In most cases, the less fuss you make over wildflowers, the better they’ll grow. Think about where you usually see them in springtime: highway medians, cracks in the sidewalk, etc. 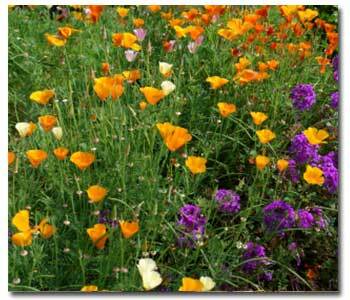 In fact, the worst thing you can do to your wildflowers is overwater and/or fertilize. While a sprinkling of compost is certainly welcome to any plant, wildflowers are tough and they like to prove it…and come springtime, with a little preparation, they’ll do just that.